Behold the stunning majesty of Kahikolu, a three-bedroom, three-bathroom vacation home in Princeville, Kauai. The tropical residence is nestled among the trees with magnificent views of three separate mountain peaks (Hihimanu, Namolokama, and Mamalahoa) and the vast blue ocean between Hanalei Bay and Ha’ena. With 3200+ square feet, Kahikolu comfortably accommodates a party of eight guests. The home is furnished in neutral tones, allowing the verdant greens and aquamarine blues of nature to take center stage. 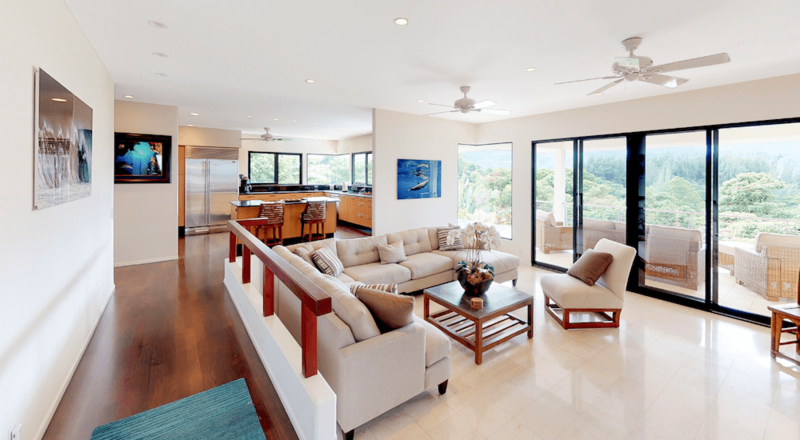 Floor-to-ceiling windows in every room provide optimal views of the stunning Hawaiian landscape. A large covered lanai — complete with travertine tile, a seating group, and ceilings fans — provides a perfect spot for morning coffee while enjoying the sights and sounds of nature. For lunch or dinner, enjoy a family barbecue using the provided gas grill. The infinity-edge saltwater plunge pool will also provide hours of fun for the whole family. The second-floor master sanctuary offers A/C, a king-size bed, and separate generous sitting area with a queen sleeper sofa. The master bath boasts a Jacuzzi tub with glass walls overlooking almost impossibly beautiful vistas. Additional amenities provided for the outdoor enthusiasts at Kahikolu include two bicycles, two surfboards, and two boogie boards. The yogis in the group will appreciate the two yoga mats. The whole group can have some fun together with the ping pong table and horseshoe pit. An unforgettable vacation is waiting for you in Princeville, Kauai.